Amid all the chaos as the household grew – Janet was followed by Carroll Jr in 1916, Dorothy (Dot) in 1919, George (Ed) in 1921, Robert (Bob) in 1925, and Martha in 1927 – Gerry chose to move in with Raleigh May’s sister Ennis and her husband Claude Reeves. Ennis and Claude had children of their own and Gerry became very close to their daughter, Louise. Gerry considered Louise another sister. 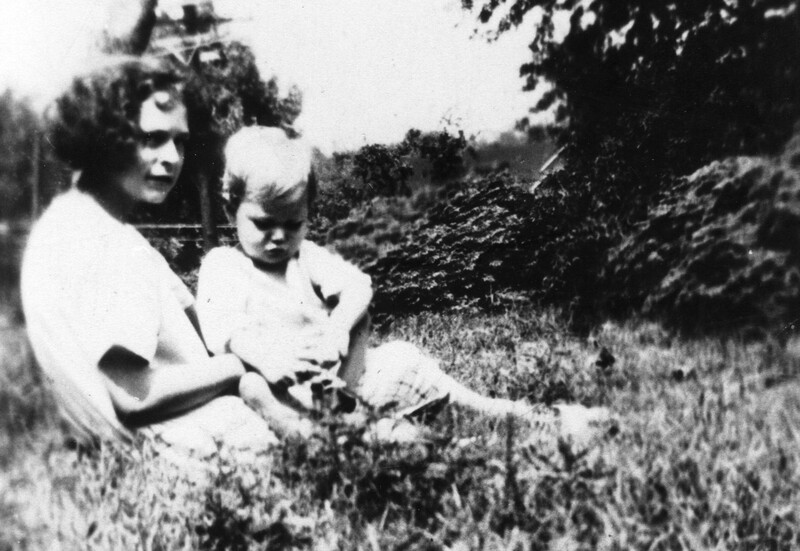 Janet was the first of the children living at the Farrar home to earn her driver’s license and took on the task of driving Carroll Jr and Dot around Atlanta in the late 1920’s. 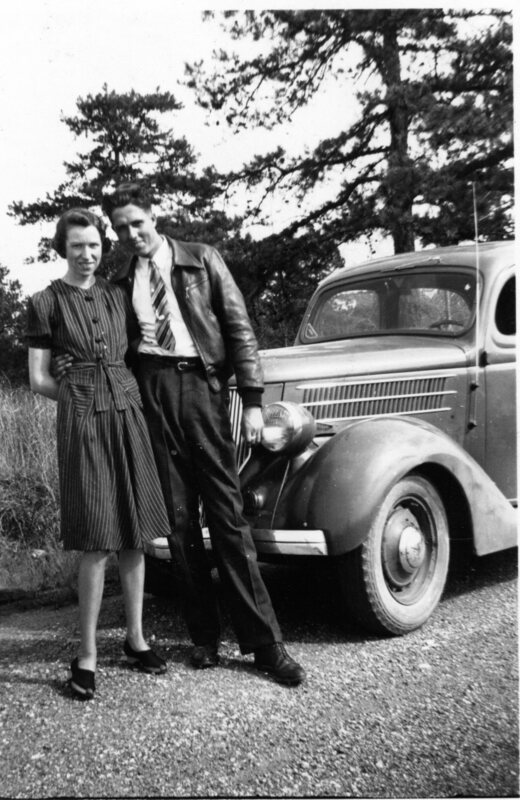 In December 1936, at twenty-four years old, Janet married Atlantan Bob Hunt. According to her youngest sister, Beverly, Janet and Bob lived just around the corner from the Farrar family’s home at 79 East Lake Terrace in the Kirkwood section of Atlanta. Janet was also known as a great shot who could pick off a lizard in the back yard. 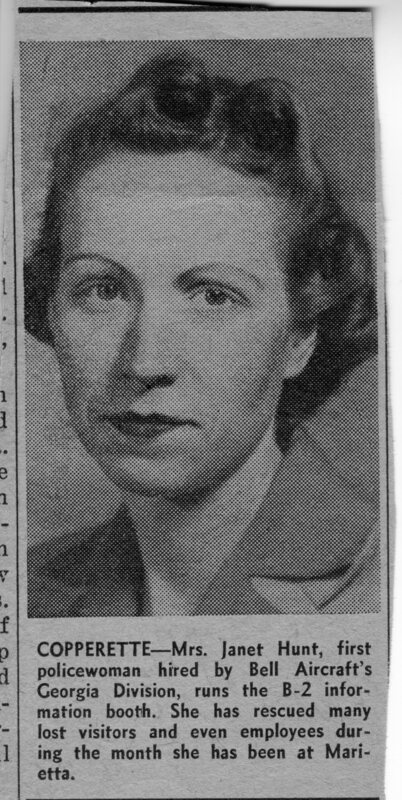 Her abilities with a gun may have lead to her employment in early March 1943 with the Georgia division of Bell Aircraft in Marietta, Georgia. She was hired as their very first policewoman and began her career at the B-2 information booth. 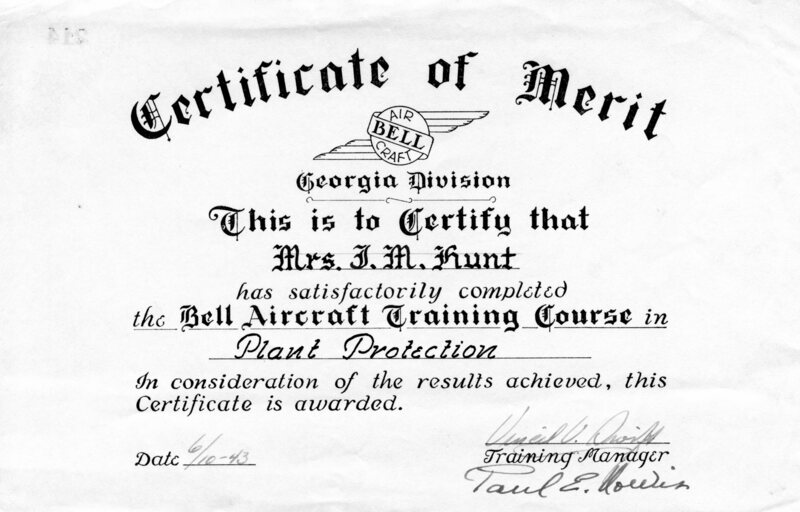 On June 10, 1943, she completed the Bell Aircraft Training Course in Plant Protection. 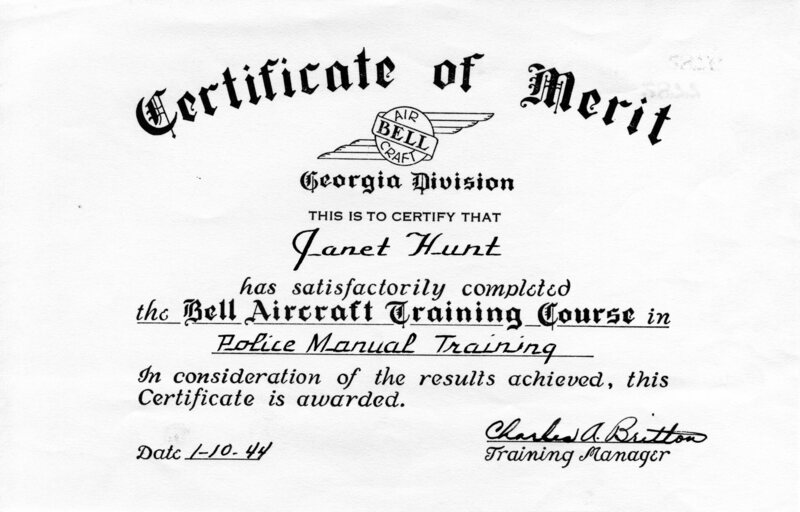 By January 10, 1944, she completed the Bell Aircraft Training Course in Police Manual Training. 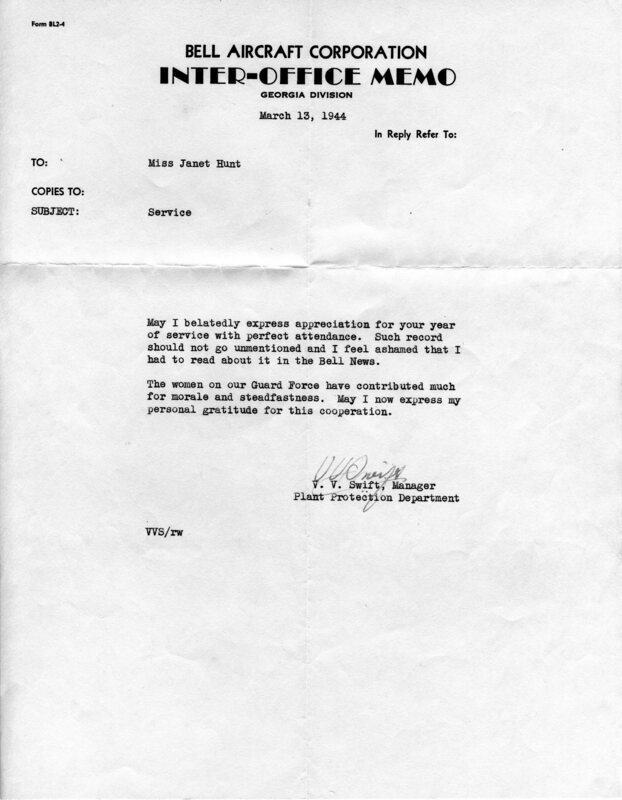 On March 13, 1944, Janet received a letter of appreciation for her year of service with perfect attendance with the Guard Force at the Bell Aircraft plant. 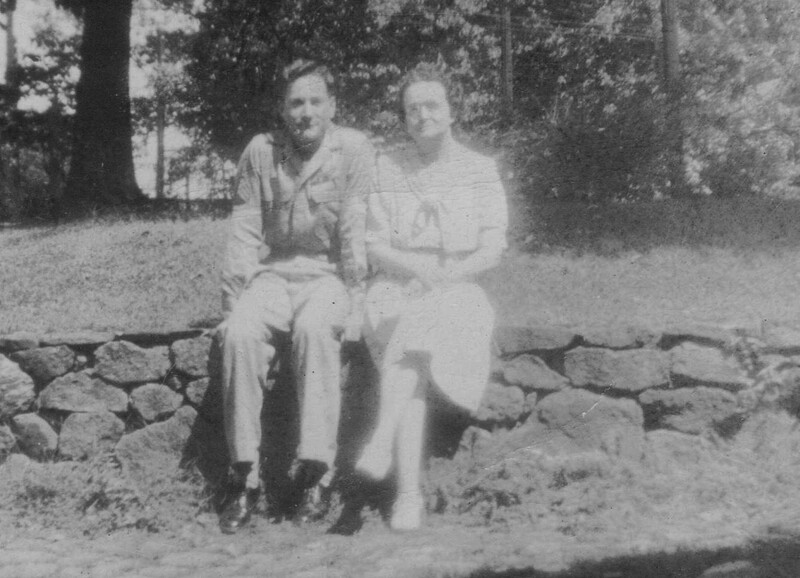 During WWII, Janet became enamored with Johnnie Smith Boyt, a fellow employee at Bell Aircraft in Marietta. Johnnie was five years older than Janet and was a widower. His first wife, Louvinda, had died in 1941, leaving Johnnie to raise their five-year-old son, Donald, alone. Janet divorced Bob Hunt and she and Johnnie Boyt married on August 11, 1945. By the time Janet and Johnnie married, Donald was nine. Janet raised Donald as her own, never having any of her own children. 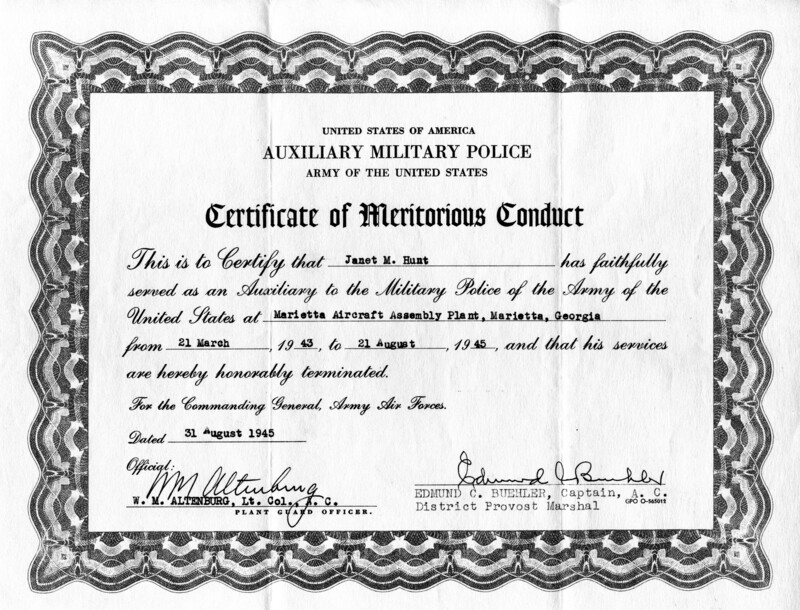 Although none of these documents explain exactly what Janet’s job with the Guard Force of the Bell Aircraft Corporation actually entailed, the Certificate of Meritorious Conduct she was awarded on August 31, 1945 sheds a little more light on the subject. Her job was with the Auxiliary Military Police of the Army Air Forces of the United States at the Marietta Aircraft Assembly Plant in Marietta, Georgia. She worked as part of the auxiliary military police from March 21, 1943 to August 21, 1945 during WWII. Janet apparently left her job ten days after her marriage to Johnnie. 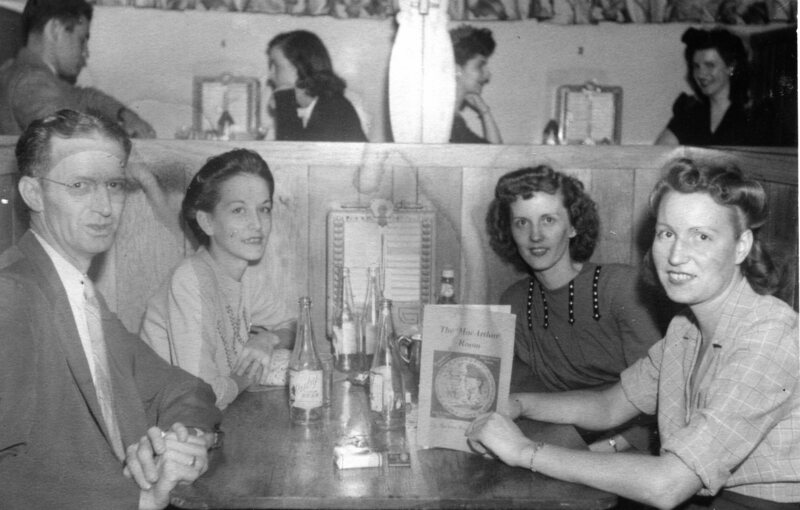 So, in addition to the three Farrar boys – Carroll Jr, Ed, and Bob – one of the Farrar girls was also involved in the war effort. 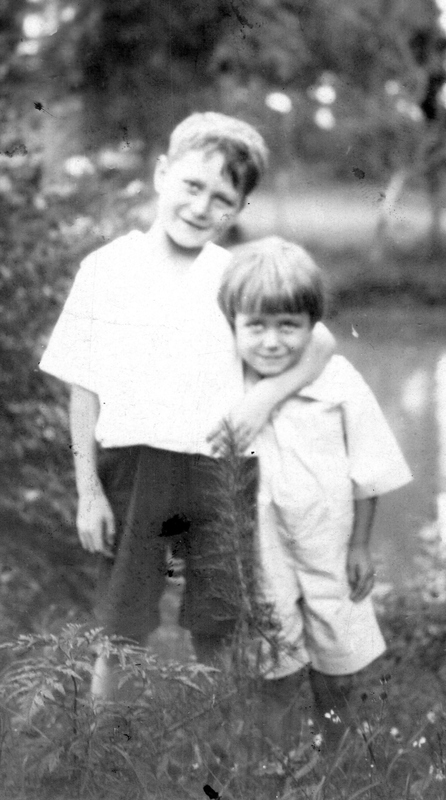 Janet and Johnnie spent most of their married life in Yatesville, Georgia. Johnnie died on December 8, 1966 at the age of 59. Janet continued to live in Yatesville and never remarried. She died August 20, 1990. Both Janet and Johnnie are buried at New Hope Cemetery in Yatesville, Georgia. 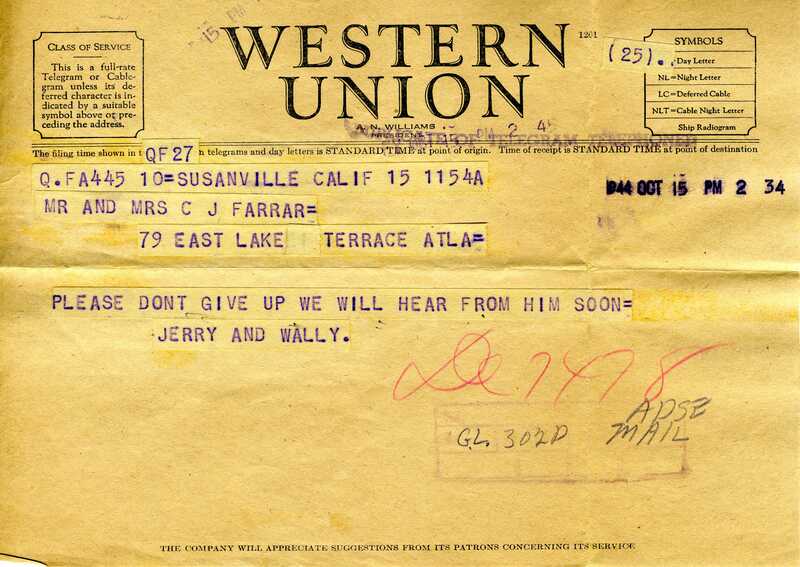 By late 1944, Raleigh Mae Farrar would have more than one son in the war to worry about. 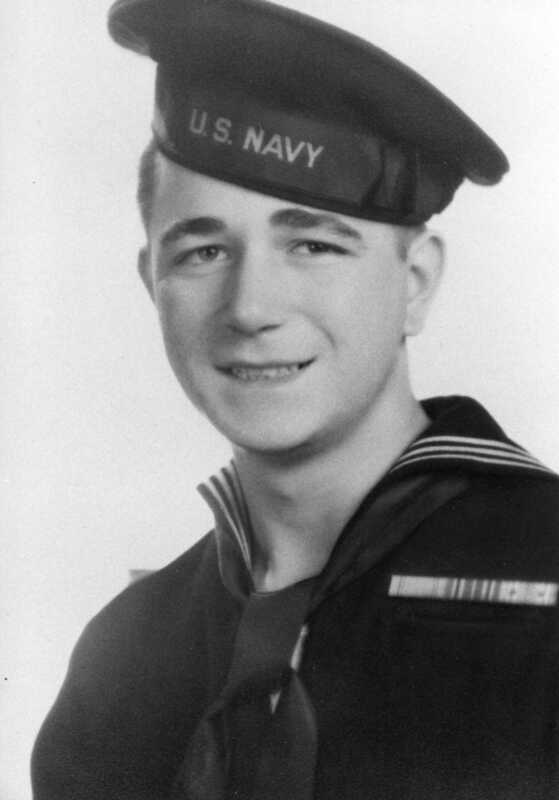 George Edwin Farrar’s younger brother, Robert Burnham Farrar, known as Bob, had enlisted in the Navy on May 8 the year before, just a few months after turning eighteen. His parents were against it, thinking him too young to go to war, but he had made his mind up that he was going to serve his country like his older brothers Carroll and Ed. Bob was serving on the USS Intrepid when it was attacked by two Japanese kamikaze pilots within five minutes on November 25, 1944, the day after Thanksgiving. Six officers and fifty-nine crew were killed, while about a hundred men were wounded. Bob survived the attack, but was injured, possibly from smoke inhalation from the resulting fire. He required later hospitalization. The fire was reportedly extinguished in two hours. Still able to sail, Intrepid headed to San Francisco the next day, November 26, for repairs and arrived there on December 20. A slide show of photos of the attack on the USS Intrepid on November 25, 1944 can be seen on YouTube. 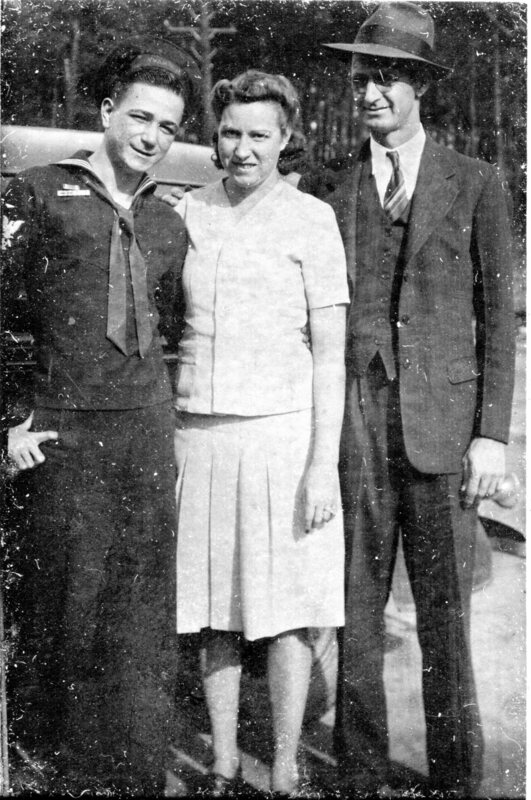 Honoring the Farrar boys of Atlanta, GA – my dad and his brothers – who served in WWII on this Veteran’s Day: from left to right, Carroll Johnson Farrar, Jr. who served in Army Air Force Service Squadron 315 from 1941 to 1945, Robert Burnham Farrar, who served until 1945 with the US Navy and was injured on the US Intrepid, which was torpedoed, and my dad, George Edwin Farrar, who served in the 8th Air Force, 384th Bombardment Group, 544th Bombardment Squadron (Heavy) from 1942 to 1945, was a POW at Gross Tychow, and survived the Black March in the Winter of 1945. All three returned home from the war.